Schools wouldn’t be a community without you and we need strong communities to help raise resilient, happy kids. Thank you for stepping up. 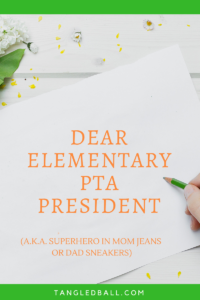 Without your efforts to bring parents together to raise awareness of the needs of the school, spearhead fundraising, and organize schoolwide celebrations, it wouldn’t be the place that kids look back on and so fondly remember. You’re important. You work hard and you signed up for it knowing that it would mean countless hours of your time. I sincerely hope that you and the others volunteering with you feel fulfilled. Often you don’t get the credit you deserve but please know that what you do makes a difference. I’m writing because October is National Bullying Prevention Month. In a way, I’m sad that it is such a large issue that it deserves its own month but the truth is that it is a pervasive and heartbreaking problem — and it starts young. As young as 4 years old and it gets messier and more complicated as kids get older. It’s a Tangled Ball. But there’s hope. We are the hope. The Go-To Trusted Adults that develop leadership skills, teach them to our children and show support. In that spirit, please consider using your power of bringing parents together throughout the year to talk about this issue. 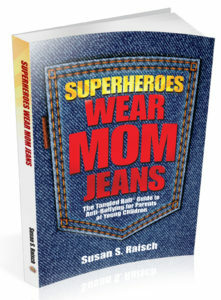 Superheroes Wear Mom Jeans: The Tangled Ball®️ Guide to Anti-Bullying for Parents of Young Children written to facilitate group discussion; to share great advice from experts from Harvard, Yale, Understood, PACER, Committee for Children, Common Sense Media and many others; and hopefully inspire a few smiles along the way. Let me know if I can help you in any way. Your kids deserve to grow to be their best selves and I’m cheering you on.